From the bestselling creators of Cloudy with a Chance of Meatballs comes a clever and silly board book that presents a unique view on perspective. 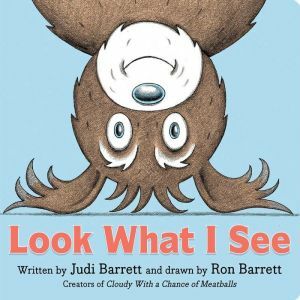 Look What I See is an inventive story that showcases the world as only Judi and Ron Barrett can see it. A study on perspective, each page asks readers what they might see in different situations—like with your eyes half shut, or upside down, or riding on a bumpy road, or looking through a magnifying glass—followed by a brilliantly illustrated answer. The up-close and personal point of view is sure to have readers giggling and trying out each position to see how their world looks from a new perspective.